We call the late season precipitation here in Vermont “sugar snow”. Served up with a drizzle of warm maple syrup, it’s a sweet treat indeed. This painting is my second effort at the same subject. The first try felt like I forgot how to paint. Thank goodness I remembered the next day. Aspiring artists can take comfort knowing that we all struggle from time to time. It’s a lot like sugar snow…it doesn’t stick around for too long. ….restrained elegance: muted, soft, discreet, subtle, quiet, unobtrusive, unostentatious, unshowy, unflashy, understated, tasteful. Thanks very much Steve, let’s plan that B. visit soon! I love this painting. Reminds me of growing up and walking threw the woods in the winter time. You certainly didn’t forget how to paint! 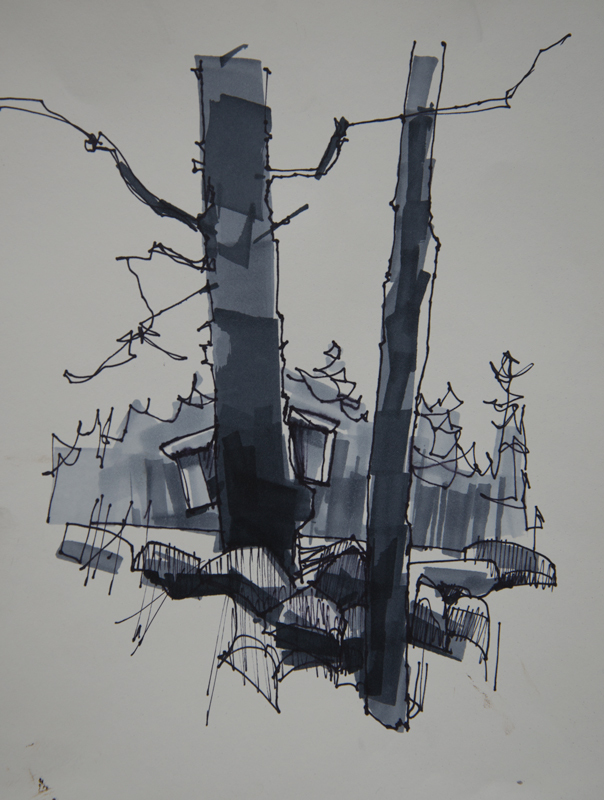 I love the almost monochromatic tones of blues, grays and occasional surprise of peeling bark beneath! This makes me want to come to Vermont and check those buckets for any left over “sugar snow”! Thanks for the wonderful portrayal Peter! Quietly powerful, like a fine woodblock print. Love the limited palette, everything muted yet alive. 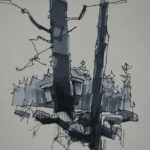 Great design, negative spaces in the branches. You pulled off the challenge of composing the scene with only two trees, rather than following the conventional wisdom that dictates three. I’d say “Bravo” (with an exclamation point) but it feels too loud to type that. Good one, thanks Steve! Are you coming this way this year? If you do we will go out and paint. Love this painting. 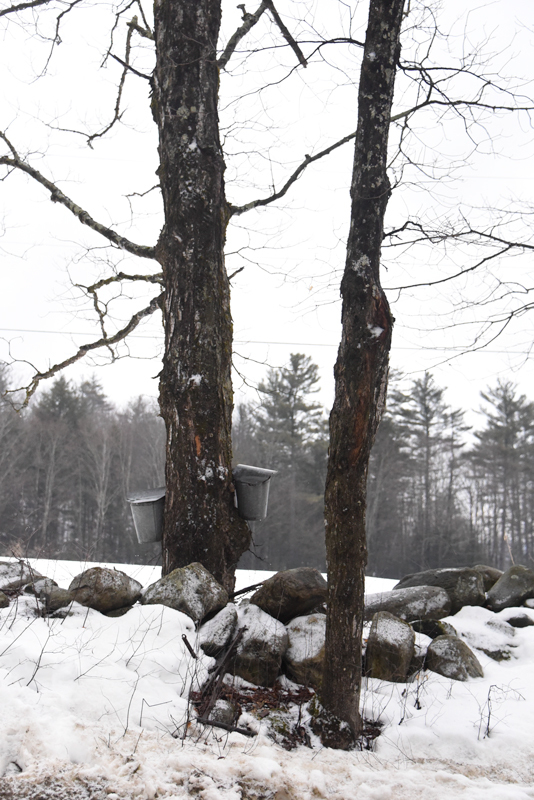 Pictures of sap buckets hanging on trees and of old stone walls are my favorites. My Mom always called it sugar snow also. 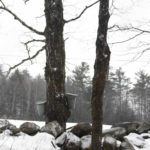 I love the term sugar snow, which is new to me…I am a NJ resident and primarily visit VT. In the warmer months. The painting is beautiful and makes me homesick for a state I love but only visit. Beautiful…I remember buckets hanging in my families woods before the pipeline was put in. Thanks Aprik, I’ll have to stop into your place and have breakfast! I LOVE this iconic painting of the sweet drip, drip of the sap running into the buckets! For some reason this one made me really homesick for Vermont (we moved 16 years ago). 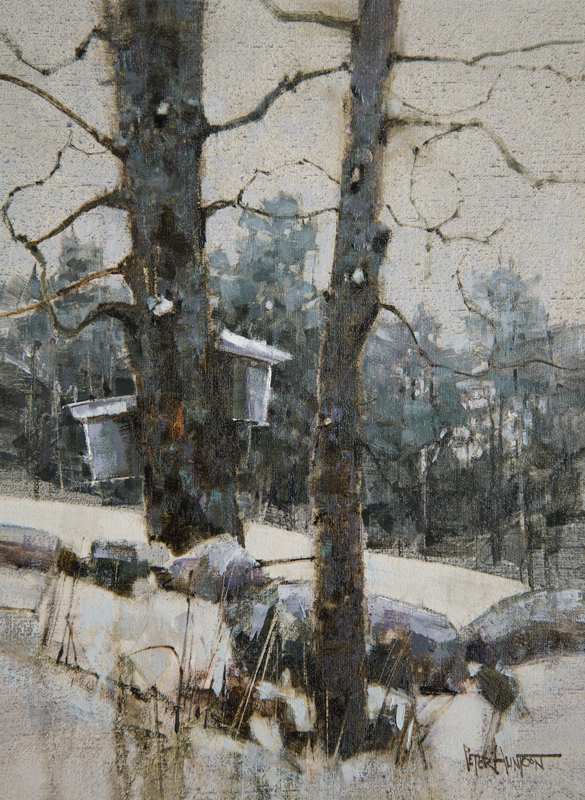 “Wow!” I can’t begin to put in words how successful you were in capturing the color, texture, and atmosphere of “sugaring season” in this painting. I anticipate that you will employ oils in your art more and more as time goes on. Great job, Peter. So glad you made that second attempt ! Funny Brian, I got the watercolors out last week just for fun…for about two hours, then put them away and got the oils back out. Maybe you are right! I have the Sugar Hill print which I love because we had a house on a back road in Wallingford that looked just like the print. Love this one as well. LOVE this!!! Great muted colors on a gloomy March? day. Thanks Pam, yes a week or two ago… late March! Beautiful painting ! We call it the onion snow here in PA.
Never heard that one but it makes sense. Thanks Joseph! I really love this one Peter. Thanks Claudia for all your support, just shipped your print yesterday. Let’s go paint plein air this summer. This goes on my list of favorites! If my dad were alive, I’d get this print for his birthday – Nov. 17th. I may just order a print for MY birthday- Nov. 16th. It would go well with the one I chose when I won the raffle. Helen’s 2 uncles (Steve and Tony Galick) also lived on and worked the farm with her father John Galick. As a young boy I remember going out to the Sugarhouses with Steve and Tony and watch them boiling sap fro the many maple trees they would collect sap from. Helen was given 2 gallons of Galick maple syrup annually trough my childhood and young adult life when it probably got to be just to much for men in their 80s. Your painting says it all and you have not forgot how to paint!! Thanks James, I think we appreciate things more when we understand the work (and love) that went into it. Maple syrup certainly qualifies! Your painting is lovely and peaceful. Thank you. This painting has to be one of my favorites. It evokes my fondest memories working a sugarbush on Bean Hill in West Glover. I keep in touch with Judd’s Wayeeses Farms on Facebook, and order from them occasionally. To me, this is the essence of Vermont. Oh, by the way, you presented it on my birthday!! Thanks, and Happy Birthday Brad! Very Dark and deep for a very light and sweet product…..Vermont Gold ! Great work Peter . Best regards & Happy Easter and Spring………. BFF Rich Stott. Another beautiful painting and memory! Thank you so much, Peter! Another beautiful painting and memory1 Thank you Peter! I Really like this painting…. Love Sugar Snow! Peaceful! Have you ever painted Lake Dunmore or Mt Mooslamoo?